Building a greenhouse? Make your greenhouses stronger by using Cross Connectors. Cross Connectors provide a fast and easy way to connect the purlin to greenhouse bows without having to drill holes. Drilling can reface bow strength by 25%. Use the cross-connectors to firmly hold pipe together. Complete assembly. Cross connectors saves time, money and makes greenhouses stronger! Six complete sets of Cross-connectors, in stock and ready to ship! Each set includes 2 cross-connector, 6 screws, and bolts. 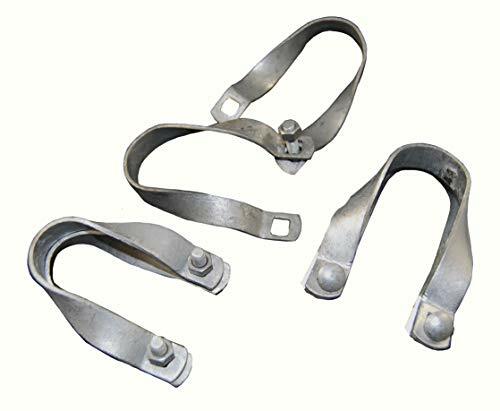 Made of heavy duty galvanized steel. Will last for years!!! Used for connecting Ridge poles & purlin to bows. If you have any questions about this product by Stephens Pipe, contact us by completing and submitting the form below. If you are looking for a specif part number, please include it with your message.